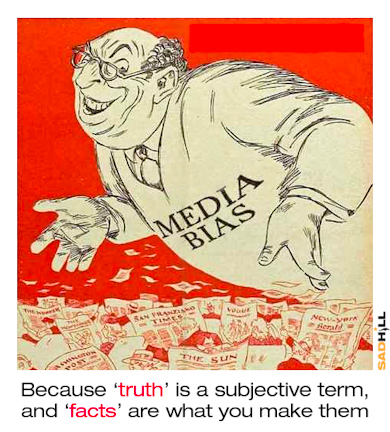 the bias or perceived bias of journalists and news producers within the mass media in the selection of events and stories that are reported and how they are covered. 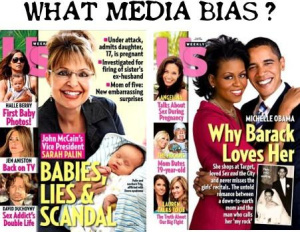 The first source of media bias that comes to mind is political. It is indeed often perceived in many countries that newspapers, magazines or TV channels occupy a clear position on the political spectrum. In French-speaking Belgium, for instance, it is commonly accepted that Le Soir is located more to the left and La Libre Belgique more to the right of the spectrum. Similarly, in the UK, The Guardian and The Times are respectively located at the Centre-Left and Centre-Right (for a classification of all UK newspapers, see here). Such biases reflect the political opinions of either the owners, or the editors, or even the journalists of the media in question. I leave it to political science scholars to comment on the social impacts of such biases, as well as on the optimal diversity of opinions in the media (for an introduction, see e.g., this presentation of “Manufacturing Consent: The Political Economy of the Mass Media”, by Herman and Chomsky, 1988). The purpose of this post is to shed some light on another potential source of media bias, namely profit. To understand how media biases can be profit-oriented, we refer to the theory of two-sided platforms, which we already presented a number of times on this blog (see, e.g., here and here). The basic intuition is pretty clear: newspapers, magazines, radio stations, TV channels can be seen as two-sided platforms that link two groups of agents: on one side, we have the audience (readers, listeners or viewers) and on the other side, we have advertisers. As is common on many two-sided platforms, the price structure is heavily asymmetric, with one side contributing to the largest part, if not all, of the revenues. For media platforms, advertisers are commonly the ‘paying side’, while the audience is the ‘subsidy side’. What do advertisers pay for? They pay for having access to the attention of the audience. Naturally, their willingness to pay grows with the audience that they have access to. In the jargon of the economic literature, it is said that the audience exerts a positive indirect network effect on advertisers. What does the audience pay for? It pays for content. The question is then how the value of this content is affected by the presence of advertising. The answer to this question determines whether the advertising side exerts a positive or a negative indirect network effect on the audience. The effect is positive if, for instance, advertising contains useful information (think, e.g., of classified ads); conversely, the effect is negative if advertising is seen as a nuisance (e.g., because it spoils the reading or viewing experience). Note that the perception of such effects is likely to differ across individuals. The sign and the magnitude of these indirect network effects are crucial to predict the importance of profit-oriented biases on media platforms. One can indeed conjecture that media biases are more likely to occur when the audience mainly sees advertising positively rather than negatively. In fact, when the audience welcomes advertising, there are positive indirect network effects on both sides. A positive feedback loop is thus in place: the larger the audience, the easier it is to attract advertisers and the more advertising the media contains, the more the media becomes attractive for the audience. In such a context, the owner of the media platform has higher incentives to favour content that pleases advertisers (or to avoid content that may displease advertisers) as this further fuels the positive feedback loop. The reverse applies when the audience mainly dislikes advertising: here, biasing the content towards the advertisers’ taste is less profitable as any increase in the amount of advertising would drive part of the audience away, thereby reducing the willingness to pay of the advertisers. Two specific cases seem to confirm this intuition. The first case (which I already described on this blog) shows how costly it can be for a magazine to publish a piece of news that upsets one major advertiser. 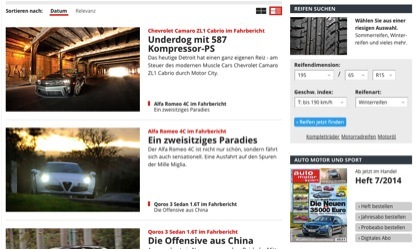 The second case (coming from a a recently published working paper) examines empirically how advertising by automobile manufacturers affects automobile reviews in a leading German car magazine. The Bulletin is a magazine for expatriates moving to or living in Belgium. In its issue of July 10, 2008, the magazine picked up a story that had already been reported in the Belgian and international press. The article described a police raid at the fourth floor of the Conrad Brussels hotel, which had been rented by some members of the Nahyan royal family of the United Arab Emirates. These people were accused of exploiting and mistreating their servants. The hotel management regarded the publication of these reports as “unethical” and decided to cancel its subscription to the magazine. Two other hotels from the same group soon followed suit. Hence, there seems to be a disproportion between the scale of readership loss and the economic consequences for the magazine. Yet, the apparent paradox quickly clears when one realizes that the rich patrons of these five-star hotels constitute the audience that advertisers value the most. Dewenter and Heimeshoff (2014) examine the potential bias in car reviews of a leading German car magazine, Auto, Motor und Sport. More precisely, they investigate whether there is a link between car manufacturers’ advertising volumes in the magazine and the reported performance of the respective cars. Ample information is available to measure the characteristics of cars in a quite objective way (horse power, trunk capacity, mileage, emissions, etc.). Such objective measures can then be used to evaluate to which extent the test scores published in the magazine are based on such objective technical characteristics or on more subjective views “suggested” by advertising car manufacturers. Our main finding is a statistically significant influence of advertising on test scores, which provides evidence that a media bias caused by manufacturers’ advertising expenditures exists in car reviews. What I would like you to do is to have a look at other economic studies of media bias and/or to articulate your own views about this issue. Here follows a list of recent papers on the topic (the dates generally correspond to the published version, while the links often point to previous, working paper, versions): George and Waldfogel (2003), Boykoff and Boykoff (2004), Mullainathan and Shleifer (2005), Gentzkow and Shapiro (2006), Reuter and Zitzewitz (2006), DellaVigna, S. and E. Kaplan (2007), Ellman and Germano (2009), Reuter (2009), Anderson and McLaren (2010), Gentzkow and Shapiro (2010), Gal-or et al. (2012).